What Are Sylvester Stallone and Michael Rosenbaum Doing in Guardians of the Galaxy Vol. 2? Rhett Rheese and Paul Wernick discuss Deadpool’s reaction to Cable. Zack Penn stresses plans for a new Matrix aren’t a reboot or a remake. Andrew Kreisberg promises next season’s Flash villain will be something different. Plus, a haunting new poster for The Dark Tower, and clips from Power Rangers and The Walking Dead. Spoilers! In an interview with The Adam Corolla Show, James Gunn revealed Michael Rosenbaum has a “decent” role in the film that’s “important to the Marvel universe.” Likewise, Sylvester Stallone’s mystery character shares deep roots with Marvel history. 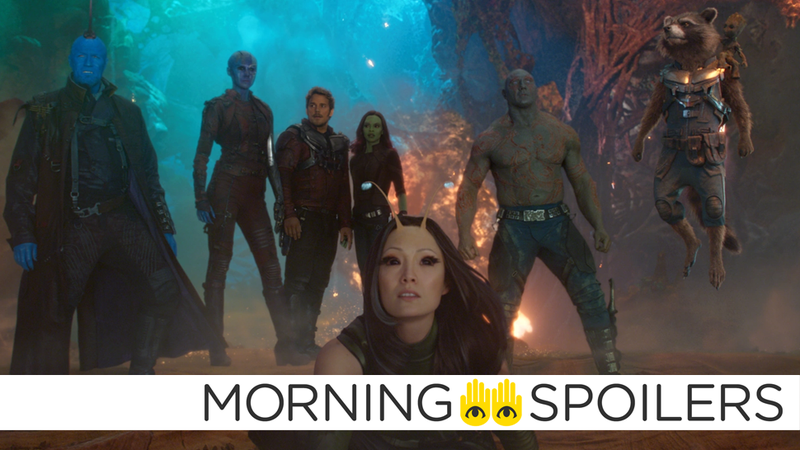 We do have a couple of characters who are very important to the Marvel Universe who are going to make their debut in ‘Guardians of the Galaxy Vol. 2’ which people don’t know about. Sylvester Stallone plays one of these characters… my friend Michael Rosenbaum also has a pretty decent role in the movie as well and it sort of works in tandem with Sly’s character. There’s been conflicting reports about just who Stallone is playing in the film—footage shown at San Diego Comic-Con last year showed him as seemingly a member of the Nova Corps, but recent rumors alleged that he’s actually a member of a race called “The Ancients” who are pulling the strings behind the Guardian’s mission. Let us know who you think they could be in the comments! While making a personal appearance on Pittsburgh Today Live, Joe Manganiello played coy about whether or not he’s still set to portray Slade “Deathstroke” Wilson in the forthcoming Batman movie. This time around, Mangianello shrugs, “maybe, we’ll see” when the topic is broached. His attitude here is in stark contrast to the confidence the actor espoused last time he’d taken a question about filming. Perhaps he was put off by the giant Smurf gesticulating in the background? Writers Rhett Rheese and Paul Wernick answered in the affirmative when asked if Deadpool would be constantly taking the piss out of the ultra-machismo nature of Cable in the movie. The pair also promised that the announcement of just who’s playing Cable “will be coming very soon,” at long last. An announcement will be coming very soon. We’re gonna go into production in the next couple of months and cast announcements will be coming fast and furious. Screenwriter Zak Penn stressed on Twitter the new Matrix movie is neither a remake or a reboot. On the Meet the Movie Press podcast, Jeff Sneider claimed David Goyer may direct the movie himself. None of this seems entirely sure, though, so take it with the usual dosage of salt. Two new Rita and Zordon-focused clips appeared on NBC Today, during interviews with Elizabeth Banks and Bryan Cranston. A new poster outlines the shape of the titular tower through the increasingly popular medium of inverted buildings. Here’s a couple of set videos of Black Bolt running in the middle of the street as pedestrians watch confusedly from the sidewalk. Deadline reports MTV is considering rebooting Scream, again, in lieu of a third season. MTV is committed to the future of the TV adaptation of the horror movie franchise according to the site, but while a search for a new showrunner is underway, the possibility of the current main cast being ejected—presumably, as this is Scream, through copious amounts of murder—is being considered to go with the new direction for the show. I will call it a surprise crossover. No one knows this because we’ve kept it under wraps, but there’s a surprise cameo, surprise crossover moment in the penultimate episode of Legends. Remaining committed to keep Katie Cassidy on the show in some capacity, Guggenheim also revealed Laurel will share a scene in an upcoming episode with Sara that will delight fans of the DCAU. I will say there is an easter egg—it’s more than an easter egg, it’s a little bit more obvious than that … that I think fans are really going to love it. And not necessarily fans of comics, but let’s say fans of cartoons. We also have a synopsis for the season finale, “Aruba.” Timequake! Jeremy Jordan revealed to TV Line that Winn’s new alien girlfriend, Lyra, will frame him for robbing an art museum. Poor Winn just can’t catch a break. Winn is feeling very deceived by Lyra, somebody he’s put his full trust in and fallen very fast and very hard for. It goes down a pretty dark path. Winn and Lyra’s future is definitely up in the air after this big deception. Finally, here’s a clip from next week’s episode of The Walking Dead.